Best Pillows I have ever purchased! Give your bedding a fresh and updated look with these comfortable Circle of Down Cotton Pillows. The pillows feature soft medium firmness and provide cushioned comfort to your head and neck regardless of your body positioning. 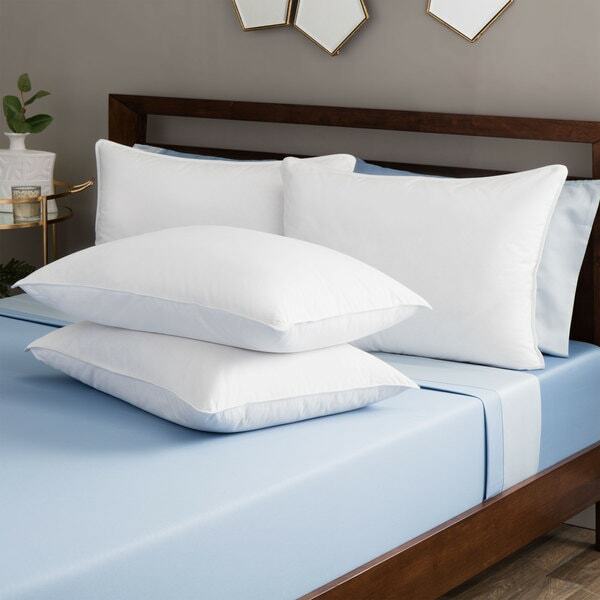 Coming in a set of 4, these pillows are suitable for a range of bed sizes and are easy to coordinate with your favorite pillowcases and linens. Please note: Some options listed or pictured may be currently out of stock. All in-stock options are listed near the “Add to Cart” button. These pillows are fantastic! I am one of those sleepers who like to crumple my pillow into a ball and go from there, my husband likes full, fluffy pillow--these do both! AND there is none of the feather trails around the bedroom, they all stay in the pillow and do not stick you in the face or head as you sleep! These pillows don't get flat or lumpy- they fluff up to perfect with just a few turns. I completely recommend these pillows! These were a killer deal - they are well-made, comfortable and it is always great to have new pillows. My only issue is that they are a little smaller than standard. My old pillows filled out the sham nicely, these are smaller - about and inch to inch and a half - I'll live with it - but I wish they were real standard size. Cannot beat the price though. Shipping was fast which alsways makes me happy! I was pleasantly surprised by the quality and comfort of the set of 4 pillows. The pillows puffed and firmed up within a few hours of taking them out of the packaging. The positive effect on my neck and head was apparent almost immediately upon using them. The ease in ordering and delivery was also a plus. The set of 4 pillows was a good value for the price. I felt after 7 years it's time to update the bedding which included replacing the pillows. I purchased my first set of these wonderful pillows over 7 years ago. I was so happy with the purchase. These pillows were soft and comfortable to lay my head on and I never experienced any feathers coming through the pillow case the next morning. After 7 years they still do the job although they have flattened out just a little. I never experienced these pillows having an odor. To keep my down bedding clean I have always covered the comforter with a duvet cover and my pillows with a pillow cover protector and pillow case. Well I just recently purchased my second set of these pillows. I read the bad reviews about them smelling and not fluffing up and flattening after use. I decided to take my chances anyway. Well needless to say I am again sooooooooooooooooooooooooooooo happy with this purchase. I took the pillows out of the box and there was absolutely no odor. I fluffed them up overnight covered them as I usually do and had the most comfortable heavenly sleep as I always have resting my head on these pillows. I will use my older set of four pillows in my guest bedroom so that my guests can experience what I do. They will be so happy since I used the fiber filled pillows before. I have in the past spent a lot of money for good down pillows which by the way didn't last me as long as long as these. These pillows do the trick for me for a fraction of the cost. I highly recommend them. I've been using these pillows for about a month, and they are great. The down makes them very soft, and the inner feather core maintains a comfortable shape. I was very pleased with the shape of these pillows; they stand higher than most pillows (though you can't tell from the picture). The pillows fluff nicely. Feathers stay inside and do not come out through the cover (as compared to some other down pillows I've owned). I ordered the "super standard" size, and they fit into standard pillow cases, but are too large for pillow shams. I highly recommend the super standard size pillows if you're using standard pillow cases as you get more pillow for the money. Overall, great quality and super comfortable. Great value for the price, good quality product! I bought these pillows to fill both of my Queen pillowcases, and the two standard shams for my duvet set. The pillows look great, especially when fluffed. I appreciate softer down pillows, and my boyfriend prefers more firm ones. They are neither too soft, nor too firm, just right, and both of us are satisfied. The only drawback is that the pillows will need to be fluffed daily. When you first open the package, the pillows are seem flat and have an odor. But nothing out of the ordinary since airing them for a couple of hours gets rid of the feather smell. I purchased this set of pillows in April 2010. I bought them to dress up my oversized King-sized bed. The king size pillows are truly long enough to fill the long pillow cases, they are quite boyant and fluff beautifully on the bed, and as the other customers have stated, they mold beautifully into any shape you need to get a good night's rest. I would have bought more if I had any more room left on my bed. They are fantastic. The 4 pillow package is a great deal, don't wait too long to purchase! I've previously bought circle of down pillows elsewhere. Expected these to be the same -- firm in the middle, soft on the outsides. After a couple of hours these pillows squish flat to only a few inches. I've had to add a third pillow to my normal two to get the height I need. If you're looking for a medium or firm feather pillow -- don't buy these. These are absoutley the best pillows I have ever purchased. I have spent over $200 on Hungarian Goosedown and none of the pillows I have ever purchased provided just the right balance of support and softness. Pillows don't get any better than this! I bought the super-standard size of these pillows after reading all the great reviews. I was disappointed when I received them. You can feel the feather stems inside, and the pillows are very, very flat. They also have a "birdy" smell. I put them outside on laundry rack for a few hours to air them out, and then put each in the dryer for 10 minutes with a softener sheet. That helped a little. These pillows will be fine inside decorative shams on the bed - and for the price, they were still a good value for that. Still, I need a new sleeping pillow and I've learned my lesson to look in person from now on! Also, the pillows in the picture are not the one's you'll receive. These pillows are flat, and gusseted, with a navy piping around the edge. There are so many five-star ratings of these pillows that it leads me to believe two different product lines are perhaps being used to fill orders for this item. There's just no way all those five-star ratings could be about the same pillows that I received. Ever stayed at an upscale hotel and wondered where they got those wonderful pillows? My husband and I have spent hundreds of dollars trying to find pillows that don't either go flat, or cramp our necks because they are too thick. These pillows cost much less (for all 4!) than we have spent previously (on just one!!) and since we got them, we have given all the other ones away. ( I counted 16 - yes...16!!!) They are VERY comfortable, look great on the bed, and stay fluffed up all night. They seem to conform to your head and position. We were pleasantly surprised. I would recommend these to anyone. I bought this item after seemingly good reviews on Overstock. The only complaint I read was that the pillows tended to flatten out a bit after a while of use. Fortunately, I like flat pillows. Then they arrived... I've never in my life slept on pillows so flat. These things smush down so your head feels like it's 1 cm off the bed (maybe less). It's as if you had a pillowcase around thin air, because there's little else in the pillow. No filling! You would need all 4 pillows to equal support of one average pillow! Remember: I like flast pillows. But this is ridiculous! Here's the thing. I read all the reviews. They are all true, even the ones that are not so good. But let me explain. The feather pillows do indeed look great and fluff up. Yes, you need to take some time with them to get them to set up and be more fluffy. The secret to these is when you are lying on them to sort of push the pillow a bit under your head and it creates the perfect pillow. To just lie on it doesn't work. You need to fluff it under your head and then it creates EXCACTLY the pillow you are hoping for. I love them. But there is a knack to using them. If you are not used to a feather pillow like this, then I just taught you the trick. I think they are worth buying. They fluff up nice and look great on the bed. Day after day. Just try the scrunch it under your head when you are lying there method and I assure you, you will be most pleased. Custom fit every time. I've made several good purchases at O before but this is a first for reviews b/c I just had to. For years now I have suffered terrible stiff necks and headaches caused by not sleeping right and waking up with all kinds of pain. I used to wake up every morning dreading how bad my neck was going to feel this time! The pillows were delivered in 2-3 business days and I have been sleeping on them now for 4 weeks. Since the first night I got them, I have not had a stiff neck ONCE and the only thing I dread now when I wake up is actually leaving bed. These are by far and away the best purchase I have made in a long time. I felt obligated to say this so that anyone out there who might be sufferering like I was with no solutions in sight...this is IT. Super comfy, a dream to sleep on every night! GET THEM! I am buying 4 more!! Finally found pillows that both my husband and I love. Slept like babies!! Very fluffy, dont get too squished down. They are very reasonably priced for the quality. I plan to buy four more for my guest bedroom. Love these pillows! these pillows are perfect. They have the right amount of filling that keeps them fluffy but still able to mold to your own preference. They are also a good size. I've had mine for over a year now and they have held up really well. Most pillows get flat after a while, these are still like they were when I bought them! I finally purchased some new pillows. These are soft and fluffy which is what I wanted. Nice pillows! Very satisfied with my purchase!! My all-time favorite pillows in my house! We live them. They hold up well, they’re so comfortable, fit well in pillow shams and make for a restful nights sleep! A little flatter and less fluffable than I hoped but ok. I used them to put in decorative shams instead of to sleep on bc they seemed to run a smidge small. "what type of feather is used?" This is filled with grey duck feather. "Do these come in a firm"
I'm only aware of one level of firmness. I would characterize them as being supportive, medium firmness. No and they flatten very easily. "Is this made in the US?" "What's the difference between super standard and standard?" The standard is 20 inches wide x 26 inches long with 28 ounces of fill and the super standard is 20 inches wide x 28 inches long with 29 ounces. "I have discs messed up in my neck & need a real soft pillow to mold around my neck & head to sleep. Do you have any recommendations on your pillows that will help me to choose the right one. Thanks, Diana"
Hello Dee, yes, this pillow would be perfect for someone who needs a soft, mold-able pillow. Thank you for shopping with us! "In one of the questions you answered that these pillows are 100% down....but in the diagram photo...it shows a feather middle. Which is it? Thanks!" Hello Baker, I'm sorry for the confusion. That is wrong. The fill of these pillows is 15 percent down with an 85 percent feather core. Have a great day! "Wait, so are you buying 4 pillows for $98 or 1 pillow for $98?" Hello Shellsy, the listed price includes a set of four. Please let us know if you have additional questions. Thanks for shopping with us. This product is not yet released, and is expected to ship on Feb. 15, 2006.